The materials and technology available where the wheelchair is made and used. Sharp edges on surfaces can cause a break in the skin, which in turn can lead to infection. Poor design can result in places on the wheelchair where the user can get their fingers or skin pinched. Wheelchairs that cannot endure daily use in the user's environment may fail prematurely and can injure the user. Wheelchairs used outdoors are subjected to greater wear and tear than those designed for indoor use or use on smooth roads and paths. A wheelchair must be strong enough not to suffer a sudden failure while being used. The wheelchair should be built to have the longest possible useful life and require the fewest repairs, or where repairs are required should be able to to repaired in the users locality with replacement parts be easily available. Pushing for long distances over rough roads. Going up and down many kerbs every day. Accessing built environments: narrow doorways, small turning areas, steep ramps, desks and tables, bathroom facilities (e.g. sitting and squatting toilets). Exposure to moisture such as rain, high humidity, snow, ice, hail and body fluids such as urine and sweat. User showering while sitting in the wheelchair. User transporting goods on the push handles, upholstery, footrests or other parts of the wheelchair. Passengers riding on footrests and armrests. People lifting the wheelchair by one armrest, footrest or push handle when the wheelchair is occupied. Transporting the wheelchair in confined spaces or other cramped or crowded conditions. Functional performance is how a wheelchair performs for different users in different environments. The functional performance of a wheelchair is determined by its unique design and features. There are many compromises to consider when designing or selecting for different uses but overall the manual wheelchair should be configured to optimise stability and manoeuvrability for everyday function. Stability is necessary to ensure client safety and security in chair use. Manoeuvrability affects access to tight spaces and the ease of propulsion. Manoeuvrability and stability in the wheelchair can be altered by adjustment of the rear axle and the front castor positions in relation to the centre of mass of the wheelchair and client. In practice an appropriate wheelchair configuration for a given client should balance their need for stability and manoeuvrability. 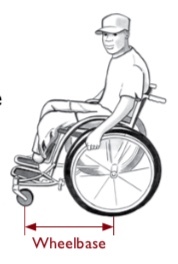 As there is a fine balance between stability and manoeuvrability, wheelchair configuration should be assessed for indoor activities and outdoor use in various environments, and should also be reviewed over time according the changes in the client’s wheelchair skills, experience and health status (e.g. adjusting axle position to compensate for weight gain or loss). The capacity for the seating to support the client’s seating posture throughout typical daily use. Wheelchair stability affects how safe the wheelchair is, and how well the user can carry out activities in the wheelchair. Wheelchair tipping causes many injuries for users. 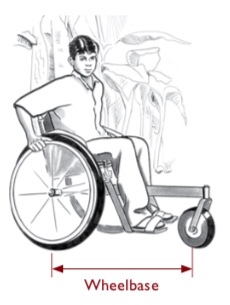 Here we look in more detail at stability and consider how to change the set up of the wheelchair for stability. Static Stability; Relates to the stability of the wheelchair when it is not moving. This determines whether the wheelchair will tip over (where some wheels lose contact with the ground) when the user, for example, leans over to pick something up off of the ground or transfers into or out of their wheelchair. Dynamic Stability; Relates to the stability of the wheelchair when moving. This determines whether the user can ride over bumps or sloped surfaces without tipping. The design features used to increase wheelchair stability have secondary effects on other functional performance characteristics. For example, moving the front castor wheel forward increases stability but reduces the manoeuvrability of the wheelchair in confined spaces. These relationships are described below. General Stability; Affected by the position of the combined centre of gravity of the user and the wheelchair relative to its wheelbase. Lowering the seat height is a way of increasing general stability and its associated advantages and disadvantages are shown below;. It may be easier for the user to reach objects on the floor. The seat, including the user’s knees, will be more likely to fit under desks and tables. Being lower may make it harder to reach objects above. The posture may be less comfortable and may increase the pressure on the user’s seat (a cause of pressure sores). The user’s pushing position may be worse and access to the hand rims more difficult. Some people, such as some double above-knee amputees, require increased rearward stability because their centre of gravity is further back. Increased tendency to turn downhill on side slope. User will have poorer access to the hand rim and a shortened push-stroke, making it more difficult to push the wheelchair and harder on the upper extremities. It will be more difficult to perform a “wheelie” to negotiate obstacles. Wheelchair is harder to manoeuvre in confined spaces. Anti-tip devices can be useful for some users who are unstable or are learning to perform “wheelies” (whereby the user raises the front castor wheels and balances on the rear drive wheels). Most anti-tip designs restrict the wheelchair’s ability to travel over uneven surfaces (such as kerbs or dips). Forward Stability; Affected by the size and position of the front castor wheel in relation to the user’s centre of gravity. Ways of increasing forward stability and their associated advantages and disadvantages are shown in Table 2. The wheelchair will resist tipping forward when the castors are stopped suddenly by an object they cannot roll over. Less weight on the front wheels will reduce the rolling resistance of the front wheels, allowing the wheelchair to roll more easily. Overall wheelchair length is longer, making it harder to manoeuvre in confined spaces. Front castor size significantly affects dynamic stability; with larger front wheels the wheelchair will be able to roll over larger obstacles without being stopped and tipped forward. Larger front castor wheels need more room to swivel; the wheelchair design will need to be much longer or wider to allow room for the user’s feet. Sideways Stability; Affected by wheelchair width. The further out to the side of the wheelchair the front and rear wheels touch the ground, the more the chair will resist tipping over sideways. Ways of increasing sideways stability and their associated advantages and disadvantages are shown in Table 3. A wide wheelchair is more difficult to get through narrow doorways. Not efficient for pushing and hard on upper extremities because the user has to reach out to push the hand rims. Camber brings the wheels closer to the user and more in line with the user’s forward push stroke, thus making it easier to push. This can be especially helpful for women, who usually have narrower shoulders but wider hips than men. Traction is better when traversing slopes. Users with advanced mobility skills and with good trunk control can partially compensate for some of the wheelchair’s instability if they can balance on the rear wheels and if they can shift their weight forwards, backwards or to the side to prevent tipping. The ease with which the direction of the chair can be changed. Moving through narrow passageways. The narrowest space through which a wheelchair can pass is determined by its width, measured from the outermost point on each side. The ability to move through narrow passageways can be improved by making the wheelchair narrower. Pulling up close to surfaces and objects. How close users can get to surfaces and objects they cannot roll under, such as toilets, low tables, counter tops, centre-post tables and bathtubs, is determined by how far the wheelchair extends both forwards and to the side of the seat. 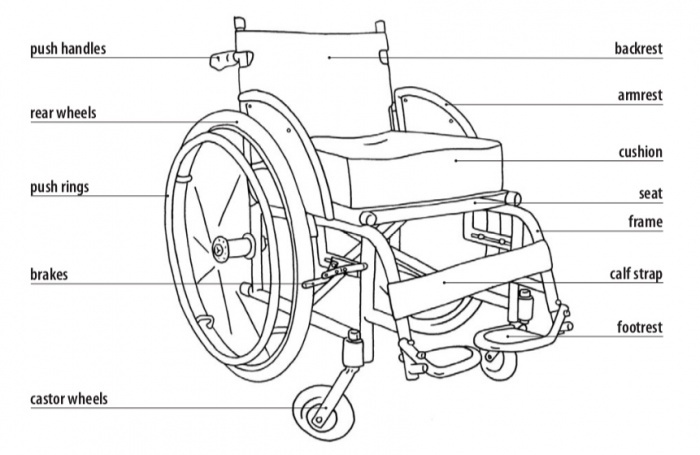 A user can get closer to surfaces and objects if the wheelchair is shorter in height. Rolling under surfaces. The user’s ability to pull up to a table is determined by the height of the user’s knees (the length of the user’s lower leg plus the minimum safe height of the footrest above the ground). Some types of fixed armrest also prevent users from pulling up to tables and counters. Turning around in confined spaces. The smallest area in which a wheelchair can turn around is determined by its maximum diagonal measurement. Easier to handle and transport. A shorter and narrower wheelchair will be less stable. Wheelchairs can only be as narrow as the user’s width plus the wheels. Improved access to hand rims. With a longer push stroke, both forwards and backwards, the user is able to use fewer strokes to turn in confined spaces. With more of the user’s weight directly over the rear turning wheel, the wheelchair is more responsive to turning. Increased ability to pull up close to surfaces and objects. Removable parts can be lost or broken. Manoeuvrability Over Obstacles; Determines the user’s ability to negotiate obstacles such as soft ground or raised obstacles. When negotiating obstacles, the user is at risk of tipping backwards or forwards and falling out of the chair, a common cause of injury; thus it is also important to consider stability when evaluating a wheelchair’s ability to manoeuvre over obstacles. Manoeuvring Over Soft Ground, such as mud, sand, grass, gravel and snow, depends on the area of contact that the wheels have with the ground and the amount of weight on the wheel. Ways of improving manoeuvrability over soft ground and their associated advantages and disadvantages are shown in Table 6. Manoeuvring Over Raised Obstacles, such as bumps, kerbs or rocks, depends on many factors. The size of the castor wheel, the distance of the castor wheel from the user’s centre of gravity and the springiness of the castor wheel all have a significant effect. Castor flutter is also a result of hitting bumps at speed. Ways of improving manoeuvrability over raised obstacles and their associated advantages and disadvantages are shown in Table 5. A wide wheel with a raised point on the centre of its tread can combine low rolling resistance on hard surfaces with good flotation over soft ground. Increasing the contact area of the castor wheel with the ground can make it more difficult to turn, especially in tight, slow turns. Larger-diameter rear wheels can make it easier to roll over rough terrain. In many less-resourced settings, 28-inch bicycle tyres are widely available; 26-inch tyres are somewhat less common, and 24-inch tyres are more difficult to find. Wider and softer rear wheels can make it more difficult to turn, especially in tight, slow turns. Larger-diameter rear wheels make the wheelchair more difficult to transport. More of the user’s weight on the rear wheels will provide more traction on the rear wheels to drive through soft ground. More of the user’s weight on the rear wheels will provide more traction to the rear wheels to drive through soft ground. Reduced tendency to turn downhill on side slope, which requires less energy from the user to correct for downhill turning. User has better access to the hand rim and a longer push stroke, making it easier to push the wheelchair and better for the upper extremities. Easier to perform “wheelies” to negotiate obstacles. Wheelchair is easier to manoeuvre in confined spaces. Spikes or knobs on tyres cause additional flexing of the tyre and thus higher rolling resistance. Mud will collect more on tyres with knobs than on smoother tyres. A softer wheel can make it more difficult to turn, especially in tight, slow turns. A pneumatic castor wheel can be difficult to repair or replace. 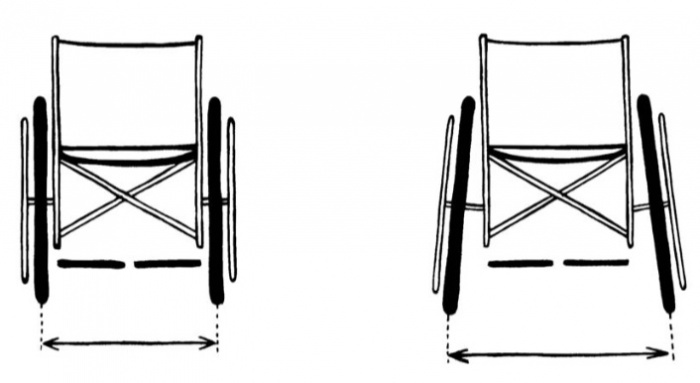 Pushing efficiency is related to the amount of energy required for the user to push the wheelchair over a given distance. Lighter wheelchairs are normally easier to push, but there are many factors and wheelchair features that affect how difficult or easy it is to push one’s wheelchair. Ways of improving the pushing efficiency and their associated advantages and disadvantages are shown in Table 6. User will not have to reach out for hand rims. A wheelchair with a broken or misaligned component (e.g. untrue wheels, distorted frame, broken bearings causing friction, unparallel wheels or poorly inflated pneumatic tyres) resists the user’s forward motion, thereby wasting much of the user’s pushing energy. Harder tyres (which deform less) have lower rolling resistance on smooth ground than softer tyres, all other factors being equal. Harder/solid tyres provide little shock absorption. Solid tyres are difficult to repair or replace (unless a supply of replacement parts is available). Tyres that return energy have lower rolling resistance than those that dissipate energy (i.e. they deform but return to shape slowly, such as solid foam tyres or inserts). Pneumatic bicycle tyres are relatively easy to repair with the right facilities. Spikes or knobs, such as those on mountain bike tyres, cause additional flexing of the tyre and thus higher rolling resistance. Pneumatic bicycle tyres can be punctured. Ability to Transfer; Depends on the type of transferral that is easiest for the user and whether the wheelchair’s structure impedes transferral. Ways of making transfer easier and their associated advantages and disadvantages are shown in Table 7. There is more room for the user to be in an easy position for transferring sideways into or out of the wheelchair. Removable components can get lost. Mounting locations can become bent or damaged, making them difficult to put on and take off. Locking mechanisms can fail, creating a dangerous situation when an assistant tries to lift the wheelchair and user up stairs while holding the armrests. It helps to transfer upwards into a taller vehicle. Ability to raise the body and take the weight from pressure-sensitive areas during prolonged sitting. Creates obstacles to easy transferral. Armrests can be easily lost or damaged. Removable footrests can allow a user to pull up closer to surfaces to which the user wishes to transfer. For standing transfers, removable or flip-up footrests are needed to get out of the way of the user’s feet. Locking mechanisms can fail, creating a dangerous situation when an assistant tries to lift the wheelchair and user up stairs while holding the footrests. Dependent on user’s abilities in transferring. Insufficient backward tilt of the seat (seat angle) can lead to poor posture and to pressure sores in users without full sensation in their buttocks. Note: Too much tilt will cause high localized pressure on the buttocks. Less backward tilt shifts the user’s centre of gravity forward, which makes the wheelchair less stable in the forward direction. During an impact, if the wheelchair does not tip forward, the seat angle and surface material (of seat and seat cushion) will affect whether or not the user slides out of the seat. Transporting the Wheelchair; For long-distance travel by, for example, bus, taxi or train, it is important to take account of the design and size of the wheelchair and the materials used in its construction. Weight is a crucial factor in transporting a wheelchair, and weight is determined by the types of component (wheels/frames) used and by the construction materials (e.g. steel, steel/ aluminium alloy or other metal). Reducing weight has a direct effect on durability and cost. Design and size are equally important, foldable and smaller wheelchairs being easier to carry. Ways of making it easier to transport a wheelchair and their associated advantages and disadvantages are shown in Table 8. Greater convenient for the user and family members/ caregivers. Makes the wheelchair easier to carry and transport. Removable parts can get lost, bent or broken. Standard push-button quick-release axles are not available everywhere and are expensive compared to fixed axles. Standard push-button quick-release axles have a shorter life where conditions of use are rough, whereby sand, dust and moisture can cause the locking mechanism to seize. This can allow the axle to slip out of the axle socket and the wheel to fall off the wheelchair. Wheel camber increases the folded width of the wheelchair. More stable wheelchairs with long frames are more difficult to transport. Spiked or knobbly “mountain bike” style tyres tend to collect more mud and soil than smooth tyres, which may reduce cooperation from taxi drivers and bus passengers. knowledge by the user of the product and its use, care and maintenance. Wheelbase; Distance between the front and rear wheels is important. When the wheels are further apart, this is called a “long-wheelbase”. When the wheels are closer together, this is a “short-wheelbase”. Long-wheelbase wheelchairs are more stable and less likely to tip forward. They can be a good choice for a person who will spend most of the time outdoors and moving over rough or uneven surfaces. There are three-wheel and four-wheel long-wheelbase wheelchairs. Three-wheel long-wheelbase wheelchairs are usually very stable and suitable for outdoors on rough terrain. Four-wheel long-wheelbase wheelchairs have the front castor wheels under the footrests instead of behind. This gives the wheelchairs a longer wheelbase. Shorter-wheelbase wheelchairs are more suited to use in places where the ground is flat or the space is confined, indoors, for example. short-wheelbase wheelchairs are more likely to tip forward if going downhill, or if the front wheels hit a bump. Wheelchair users with good mobility skills may use a short-wheelbase wheelchair outdoors by balancing on the back wheels to go down hills and over rough ground. Size and Width of the Wheels; The larger the wheel, the easier it is to push over uneven ground. Wide rear wheels and large and wide front castors help prevent the wheelchair from sinking into sandy or muddy ground. policies and strategies, including long-term sustainability. ↑ 1.00 1.01 1.02 1.03 1.04 1.05 1.06 1.07 1.08 1.09 1.10 1.11 William Armstrong, Johan Borg, Marc Krizack, Alida Lindsley, Kylie Mines, Jon Pearlman, Kim Reisinger, Sarah Sheldon. Guidelines on the Provision of Manual Wheelchairs in Less Resourced Settings. World Health Organization; Geneva: 2008. ↑ Visagie S, Duffield S, Unger M. Exploring the impact of wheelchair design on user function in a rural South African setting. African Journal of Disability. 2015;4(1).